Termite only: Report only evidence of termites. A clearance letter is issued. Wood Destroying Insect (WDI): Most common type of inspection performed, required for any FHA/VA/HUD financed loan. Many "conventional" lenders are starting to require this level of inspection. This inspection includes termites, carpenter ants, carpenter bees, powder post beetles (found in most century homes), old house and round-headed borers, and other insects that may damage wood in structures. The report regarding the findings is put on the NPMA-33 form (Wood Destroying Insect Inspection Report). Complete Pest Inspection: This inspection will usually include all of the above plus any other insects (spiders, roaches, centipedes, etc. ), rodents, and other animals found in the structures. The report regarding the findings is usually put on the NPMA-33 form (Wood Destroying Insect Inspection Report) and other insects or animals found will be indicated on an additional letter or form. The presence of wood destroying insects present a significant hazard to homebuyers and sellers. These insects can cause serious damage to structures if left undetected. Other insect or animal infestations can be of concern in regards to the health and well being of humans and animals living there. Buying a home is one of the most important purchases a person will make in their lifetime. A home inspection will give you an idea what physical condition the home is in at the time of purchase. However, one overlooked but still very important inspection that should also be done is a "pest inspection". Even if you are selling a home you should still consider having this done. There are a few varieties of pest inspections available and it is important to know the difference between them. FHA/VA/HUD require that a "Wood Destroying Insect (WDI) Inspection" be performed before the underwriter will guarantee the loan. The title agency or mortgage company usually orders this inspection, however, sellers or buyers can usually request their own choice of inspection company. Currently more and more lending institutions (banks, savings and loans) are requiring this caliber of an inspection be done on a "conventional" loan too. One very important aspect of any inspection is that they are limited to the readily accessible areas of the structure at the time of inspection. Stored items, appliances, fixed/suspended ceilings, access panels, etc., can limit accessibility in the structure. Inspections are normally limited to structures on the property only. Few home inspectors will provide this service, but usually it is a licensed professional pest control operator who should perform this inspection. 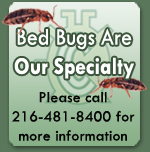 They have be trained and licensed by the Ohio Department of Agriculture in structural pest control identification and control strategies. Currently, all diagnostic pest inspectors are required to be licensed by the Ohio Department of Agriculture in category 10b/12. When selecting a professional pest control operator, check to see if they are members of the local, state or national pest control associations. Also, ask what type of inspections they perform. Your local better business bureau (BBB) can also give you information. If you have any questions regarding pest inspections, please send us a E-Mail or call.